Every summer this time of year the basil plants in my garden are lush and beautiful, full of fragrant leaves I love to pick and add to whatever I’m cooking – a simple garden sauce, an heirloom tomato salad, grilled chicken bruschetta, a lovely summer fish dish, just to name a few dishes. Pesto is one of the things I whip up all summer long, but pesto can have a lot of oil and fat when made traditionally which can make a dish heavier than I would want, so to make it skinny I use a bit less oil and leave the pine nuts out and no one ever complains. Making pesto at the end of the summer and keeping it in the freezer is also a great way to use up the last of the basil from your garden so that you can enjoy it year round. Store in a sealed container and refrigerate until ready to use or you can freeze this in ziplocks bags to use at a later date. I love this pesto & I make it every week!!! Amazing! Quick, easy, and delicious. This is definitely a keeper recipe. I made this and froze in one tablespoons portions in my silicone mini muffin cups. I then remove them from the cups and freeze in a zip lock to be able to take one out at a time and use! Great recipe and I did not miss the pine nuts. Just made 3 cups of this from my garden basil. 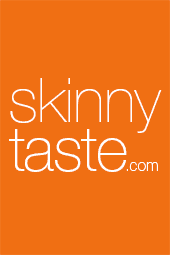 It is delicious and no one seems to realize it is “skinny”. You can also replace a little of the oil with some lemon juice. I add a teaspoon or two of lemon juice which brightens it and allows you to reduce the oil even further. Hello! Sorry if this has been asked, but has anyone tried freezing this basil pesto for use at a later date? My basil is going crazy and I’d love to store some. Thanks for any insight! This is awesome! I love pesto but I’ve got a kid with a nut allergy so I’ve been weary about it. For some reason I never thought to make my own without nuts! Thanks! Best pesto I have ever made! Thank you for sharing. I LOVE ALL of your recipes (I have your cookbooks and scour your blog religiously)!!! I recently joined WW and your nutritional info has been sooo helpful in calculating everything I make. I noticed that you didn’t have any Saturated Fat or Cholesterol listed in your nutritional info on this one. Is that because they are zero?Thanks!! This is now my favorite pesto recipe – thanks! One really great way to freeze this is using an ice cube tray. Allows you to freeze individual serving sizes. Especially convenient for those cooking for one or two. How much in cups or ml is this, any idea? You made me a star! This recipe was the best. OK, maybe second best. Your low-fat chocolate chip cookies are #1. We make a “Green Eggs with Shrimp” using this pesto. It’s really good and my family asks for it again and again…..just make scrambled eggs mixture, add pesto and cut up cooked shrimp, Fry as you would and voila! I use 4 eggs, about 2/3 cup of milk, 2 Tbsp pesto and 6 ounces of shrimp to feed 3 hungry eaters or 4 typical. We love it! If using basil already chopped how much would you use? 1 cup whole leaf and 1 cup chopped are very different. Thank you! who used virgin olive oil? was the pesto good? Thats what I always use in my food – was not bitter. I want to make this tonight. Someone said that their pesto turned out bitter because they used virgin olive oil. That’s all that I ever use. Anyone use virgin olive and had a good pesto result? II have always used chicken broth and no oil.. Also did it in my blender. Can make it any consistency you want. I have frozen it for long periods of time and always tastes great. Gina, do you think you’d ever switch to weighted measurements? Measurements by cups/spoons yield different results person to person and is highly unreliable when counting macros and calories. I have a hard time believing your macros because of this. Unfortunately not at this time. There are numerous sites that have done the conversion for you. Sorry! Someone said that they used olive oil and that their pesto came out bitter. I always use virgin olive oil for anything. Will that work with this recipe? Was planning on making it tonite. I usually use extra virgin oil. I have been inundated with a beautiful crop of basil. Today I made several batches of Pesto. After the Pesto was blended, I froze scoops of Pesto on a parchment paper lined cookie sheet. When it was solidly frozen I placed them in a freezer zip lock bag and hope to enjoy them until next year’s crop. Couldn’t wait to try it, and had it for dinner on pasta. Thanks for sharing this delicious recipe. I like to cut back even more on the oil and add a bit of lemon juice to the mix. It thins the pesto to a usable consistency and brightens the flavors. Thanks for such great recipes! I made a big batch but it turned out bitter. After doing some research discovered two things. One- you shouldn’t use extra virgin olive oil for pesto. And two – follow directions carefully. Gina had said to slowly add the olive oil and “pulse,” I didn’t follow those directions and should have pulsed. Apparently If the oil is emulsified in a food processor, the polyphenols get squeezed out and the liquid mix turns bitter. Just thought others would want to know if their pesto turns out bitter. I’m going to the store today to buy just regular olive oil and try it again. Have to wait a few weeks until basil plants produce more. I know it will turn out great this time. I love all of Gina’s recipes and never have any issues. I just made this recipe and it is sooo good. Love the fact that it doesn’t need that much olive oil. I make this pesto all the time and love it!!!! Gina, this may already be in the comments and I missed it but is there a big difference between a food processor and a blender? Could i use a blender instead of the food processor? Thank you! I made this the other day and WOW is it delicious! I used it on baked tomatoes and on a few caprese sandwiches. So so so delicious and super easy to make! Thanks for the recipe! I make a double batch of this every time, but it's still never enough. It's just such a easy meal maker. It's such a meal elevator! I leave out the cheese entirely, it can always be added later, and you really can't tell the difference in taste. Plus, leaving out the cheese is better for freezing I believe too. 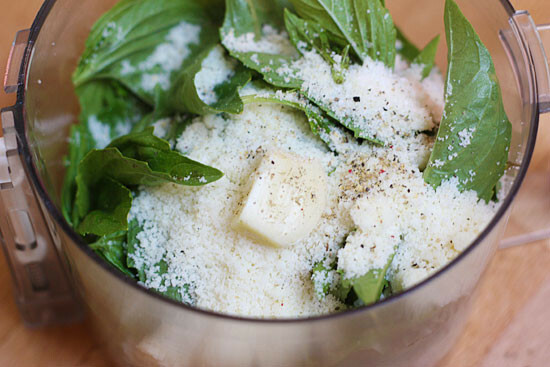 You can always grate parmesan on your dish and control the amount. This receipe is fabulous. Helpful hint that I use is, after pesto is placed in jar & top flattened out press a grape leaf on top which will reduce oxidation. Do you have to mince the garlic before, or do you put an entire clove of garlic in the food processor? Not at all, but I like to smash the clove with the flat of the knife to bring out the oils. If I may humbly suggest: definitely mince the garlic before adding to the food processor. This will ensure the flavor of the garlic permeates the whole batch and that you don't end up with any big chunks of garlic to bite into. Plus, there's what Nino said, the flavor is better. I just recently discovered that I LOVE pesto. I've been missing out ALL these years. Had it for my 43rd birthday a few weeks ago and could not get over its flavor. I knew I had seen your recipe posted before so I whipped your version up today and it is amazing! I added a small squeeze of lemon. HOW MUCH PESTO WOULD YOU USE TO A POUND OF PASTA? Made your Pesto Baked Chicken eariler this week, so good! I had some leftover pesto and tossed 1 tablespoon of it with 1.5 lbs of roasted red potatoes for dinner tonight – amazing! Thanks – love your blog! For a change, my daughter and I love Sundried Tomato pesto. To make it myself, can I use this recipe and swap the basil out for sundried tomatoes? Or do you think I should include some basil still? I used Oliveri's last night and just about killed my points. I toss sundried tomatoes in with my pesto when I'm making a pasta dish -it adds little bursts of tomato yumm! Just made this with the last of the basil from my garden. I toasted 2 tablespoons sliced almonds (for about 10 minutes at 350), and added them to my food processor with everything else, By my reckoning, it's adds about 18 calories per tablespoon. Great recipe–it's really yummy. I was tried to make Pesto sauce tonight but it came out sour. What could I have done wrong? Just wondering if the cup of basil is packed or loose? I have been searching for a good pesto recipe. I just tried this one, made a double batch but kept the oil amount for a single batch. I added lemon zest and the juice of a half lemon. I also added red pepper flakes for a kick. It is so good! I am on to zucchini muffins and added a tablespoon of pesto to the recipe. Thanks!!!! Gina, I just made this for the first time and LOVED it. I used it as a spread on whole grain bread topped with roasted veggies (summer squash, zucchini, grape tomatoes, peppers, garlic and onion), and some fresh mozzarella cheese. DELISH. Thank you! I have used a mixture of Basil and Spinach and it turns out great. I read a recipe in a magazine that says to add a little water in place of the oil. Makes for a lighter tasting pesto. First time i made pesto!Its something we eat rarely but i like it a lot! !the lovely smell and the Parmesan cheese…mmmmmm…I made it for your recipe the chicken kebabs and i liked it very much!will make again!thanks a lot!!!! DELISH!! I did 1 T coconut oil and 1.5 T olive (my coconut oil is liquid right now). Also, I used a HUGE clove of garlic so mine had some kick. I thought it might have too much kick for the kids so I mixed most of it with a jar of whole peeled tomatoes for a wonderful pasta sauce (just needed a little extra sea salt since the tomatoes are JUST tomatoes). I also had some broccoli stems left over (the tough part that most people don't like to eat) and threw those in. Couldn't taste it but just upped the vitamin content. My kids at 3 helping of ravioli with the basil tomato sauce! Thanks for the recipe! I used a mix of basil and lemon basil. This was SO GOOD! Even my husband who turns his nose at things that are green ate a fair amount. Thanks for the recipe! Will it come out ok if I replace the basil with fresh spinach?! It will have a *completely* different flavor, as the basil is the main, most flavorful ingredient in the dish. The basil is what makes pesto taste like pesto. Because pine nuts are expensive here, I used walnuts. And fresh basil isn't as common where I live (in Southeast Asia) so I make it using fresh coriander (cilantro). Comes out beautifully; made some angel-hair pesto pasta last night and my dad, who isn't a pasta person LOVED it. I want to make Pesto for my relatives as Christmas gifts. I far in advance can I make it? Does it have to be frozen or refrigerated? Can I use day old basil leaves? They turned color in less than 24 hours. You won't get that green vibrant color if you do. Fantastic pesto. I'd been using the Jane Brody recipe with some broth, but so not necessary. I'd been going to that trouble for nothing, as it turns out. I doubled it but kept the olive oil at slightly less than 1/4 cup (4 T) and it's absolutely fine. Figured I could shave a little bit and not harm taste, which turned out to be true. I WILL county 2 PP per tablespoon tho! I made a double batch in the mini prep. I tried it and it came out great. I then put it with the basil pesto chicken. Great dinner. The rest I will freeze. Thanks Gina . Gina, I to do not have a food processor . Can I use a blender or a mini prep processor? The mini prep does not have an opening at the top to pour oil in. Can I add a little at a time and try to blend it that way? Does anyone know how long this would keep in the refrigerator or should I just freeze it? Also, Gina-I LOVE all the recipes I've tried from your site! Everything is quick, simple, fresh & healthy!! Also it's usually made with common ingredients, no running around trying to find strange ingredients I'll only use once! GREAT JOB & my family thanks you too!! We just had pesto last night. I was just telling my fiance that I wanted to try to make it homemade, instead of the packet – is there a way to make it without a food processor? I realize this comment is six years old but yes – mortar and pestle, the traditional way! I was thinking about using garbanzo beans in place of pine nuts. This seems like it would bulk it up quite a bit. Olive oil is such a great, healthy fat for you and the regular amount is NOT bad for you at all!!! I like to add baby spinach in with the basil for added nutrition, and use raw almonds in place of the pine nuts. This recipe for pesto is fantastic! I LOVE it! 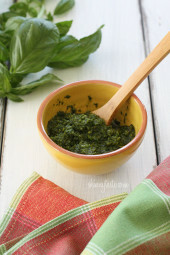 I often make Basil-Chard-Pesto in the summer as we get lots of swiss chard in our farm share and it's a great way to use it up! I blanch the chard, shock in an ice bath, squeeze it out and add to the food processor with the basil, cheese, oil, garlic and whatever nuts we have on hand. Makes a great dip on it's own, or mixed with low-fat yogurt too. I have used chicken broth in the past and it takes the flavor out of the pesto. DH hated it. You don't have to use too much pesto to add flavor. It is not worth wasting the fresh Basil to try it. Take Gina's advise. Thanks Gina! This is a great one! To freeze I place a large sheet of plastic wrap over a plastic ice cube tray, twice length of tray. Start at one end and push the plastic wrap into every other cube, leaving some bunched between. Put the pesto into the cubes. Wrap edges of the wrap over the top and freeze. Take out and cut between each cube. Keep them on the wrap and put the batch into a freezer baggie. You can then take out the cubes as you need them. Color stays bright since they don't get exposed to air this way. I add apples sometimes to my pesto. Usually yellow apples since they have such a mild taste, but if you dice them super fine, they have a nice little crunch and you don't miss the pine nuts as much. I use walnuts in my pesto because of a serious case of 'pine mouth' two summers ago from stale pine nuts purchased at the grocery store. Google it. It's weird! 🙂 I actually like walnuts better now. 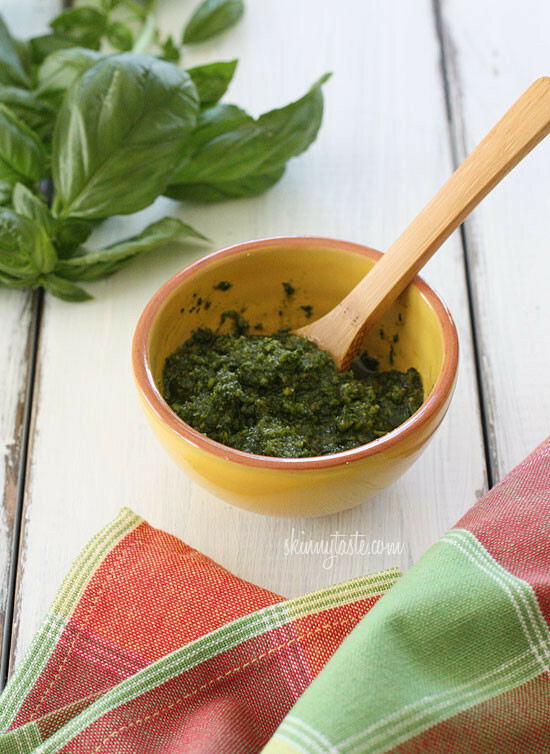 This looks like a GREAT skinny-ized version of traditional pesto! Well Ms. Gina, I didn't waste a minute and made this recipe tonight! Had a hard time rounding up enough basil since I don't have a garden in my apartment, but I got enough for this! Amazing and delicious as always! I mixed 1/2 a TBS with spaghetti squash, chicken, and sundried tomatoes for dinner tonight. Yum yum! Hi, I have basil in my garden, but it smells like licorice. It didn;t smell this way when I planted it, but now it smells differently. The last time I tried to make pesto, it tasted awful (I think because the basil was bad). Any idea about this? Where might I get fresh basil for this (if I cannot use the one from my garden)? You probably have Thai basil I your garden. It has smaller leaves and a anise or licorice flavor. Used in some Thai food recipes. I loooove pesto, but I can never bring myself to spend the points on it! This is great! I can just use 1/2 a TBS at a time if I wanna! This looks fantastic! I've made pesto without the oil before but never tried skipping the nuts. Can't wait to give this a try! I mixed this up into some tuna with light mayo and some lemon pepper and it made a pretty yummy tuna salad! Thanks! I've made pistachio pesto before and never looked back. Almost half the fat content of pine nuts and in my opinion, tastes so much better! This looks good but a little dry. I used a little bit more olive oil and also used sweet basil and lemon basil. It makes for a beautiful taste the lemon & sweet basil. You can also add some ricotta to make up for the loss of volume due to lessening the oil. I have had year old frozen pesto that was still good.. but my freezer is very cold(the alarm goes off if it gets above 10) I freeze some in ice cube trays and 1C. in zippered freezer bags. Have been making a lower fat pesto for years by substituting tomatoes for oil and use what ever nut suits my fancy… 1C. firmly packed washed and dried basil,spinach or parsley(i usually mix), 1C chopped tomatoes, 2T. toasted nuts, 2cloves garlic(toast with nuts so it does not get hotter while frozen), 1/4c. grated parmesan process this and drizzle in 1T. olive oil to emulsify at the end. Yummy! I use raw almonds in my pesto – works great and they are the cheapest and most healthy nuts available! 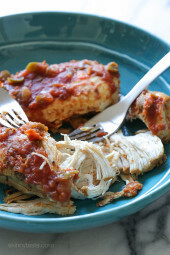 I recently discovered your blog and every receipe I've made is FANTASTIC! Thank you! The photo has a garlic clove, it just didnt photograph well. Personally I feel the flavor of the Parmesan cheese makes the pesto so I wouldn't reduce the amount, but if you have an allergy to cheese, then sure you can replace the cheese with walnuts, pine nuts, etc. Parmesan cheese is pretty low in fat so if you want to use half and add nuts you'll have to re-calculate to see what the results are. To measure the basil I just pack a measuring cup with it. Yummy..I put some raw sunflower seeds instead of pine nuts, simply because I usually have them and it is something I used to do as a broke college student from the recipe for pesto in Diet for a Small Planet. It is really delicious, probably 2 Tbs per batch would be good. Great idea! I've tried walnuts, which are delicious but still a bit expensive. I will try sunflower seeds. I always have them in the house, too. They are great on salads. I have so much basil in the garden and was planning on making a bunch of pesto sauce. This is perfect timing. I like your skinny take and avoiding the pine nuts. I never thought you could get away without them in the recipe. Thanks for sharing! We've been making pesto like crazy this summer and we always make it with walnuts instead of pine nuts. They have less calories and a lot more health benefits than pine nuts and you can't tell the difference in taste! I am curious on the answer to T-Dogg's question too though. I may make some using this recipe and label it "Mom's Pesto" in the freezer. 🙂 Tip: When freezing your pesto, line an ice cube try or mini muffin tin with a generous piece of plastic wrap. Then spoon your pesto into it and freeze. When it's frozen, getting the portions out to put in freezer bags is SO much easier. Silicone ice cube trays are perfect for making baby food and pesto cubes because they are super easy to pop out! Also- almost any nut can substitute for pine nuts… I used pistachios! Hi Alyssa! So with the silicone tray, you don’t need to worry about plastic wrap? If this is the case, I’m going shopping right now! 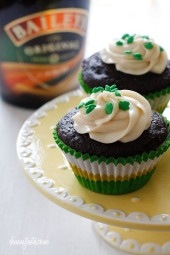 There is a mystery ingredient, that looks suspiciously like butter, in the picture. Can you tell us? I think it is the clove! It looks like a half clove of fresh garlic to me. it also might be the top of the food processor blade (mine looks like that). was there butter in the recipe? I couldn't help notice the Cookies for Cody ad on your page. After checking it out I'd like to encourage everyone to check it out. It's a very worthwhile fundraiser for a very important cause. There are many offerings for those with special dietary needs. What's the best way to measure out herbs? I've never been able to get that right amount successfully. What's the fat trade off between pine nuts and the parmigiano reggiano? Could you cut half of the cheese and add some pine nuts instead? Not sure but pine nuts are SO expensive these days that I won't be changing the ratio here. Looks great, BTW!